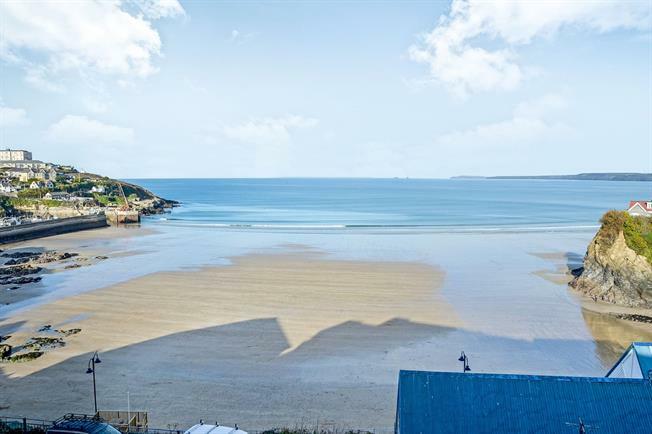 This spacious modern purpose built penthouse two double bedroom apartment with panoramic sea views has a bathroom, en suite shower/cloakroom, lounge/dining room, fitted kitchen, and reception hall, with under floor central heating and uPVC double glazing. Outside there is a good size level allocated block paved parking space. Viewing is strongly recommended - Chain free. Double glazed communal entrance door with audio door entry phone. Lift and stairs to all floors. Personal entrance door. Audio door entry phone. New Oakwood flooring. Doors into two bedrooms, bathroom and living room. Electric circuit breaker fuse box. UPVC double glazed recessed picture window overlooking the sea, Towan beach and The Island. Under floor heating. New Oakwood flooring. Open plan onto kitchen breakfast area and door into utility. Incorporating range of white fronted modern units comprising four base units drawers and two wall cupboards with work surfaces, breakfast bar, single stainless steel sink and drainer with mixer tap over, electric oven with ceramic hob and extractor over. Integrated fridge/freezer. Incorporating over size shower cubicle with glazed sliding door, Low level flush WC and wash hand basin. Tiled walls, tiled floor. Extractor. Centrally heated ladder style towel rail. UPVC double glazed picture window to rear. Radiator. Carpeted floor. Incorporating panelled bath with glazed shower screen over, low level flush WC and wash hand basin. Tiled walls, tiled floor, extractor, centrally heated ladder style towel rail. Allocated numbered level block paved parking space at the front.